Marvel's plans for their new Star Wars comics were easier to come by than the plans for the Death Star. 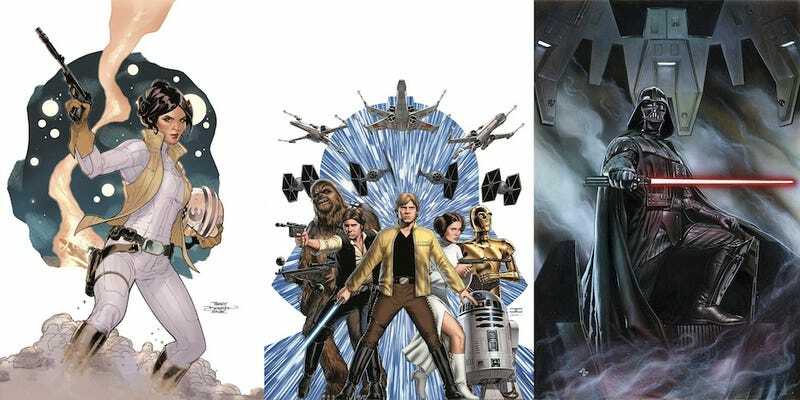 Joe Quesada revealed the details of the series first three titles — Star Wars, Princess Leia and Darth Vader — all due early next year, and all taking place after the events of A New Hope. The main title will be Star Wars, written by Wolverine and the X-Men's Jason Aaron with art by John Cassaday, as Luke and the others continue the fight against the Empire. Princess Leia will be written by Mark Waid with art by Terry Dodson, following the Rebel leader as she deals with the loss of her planet. And Darth Vader features the Sith Lord trying to reclaim his rightful place in the Empire following the destruction of the Death Star, and be written and drawn by Kieron Gillen and Salvador Larroca, respectively. Star Wars will come out in March, Vader in February, and Leia in March. Check out the covers!